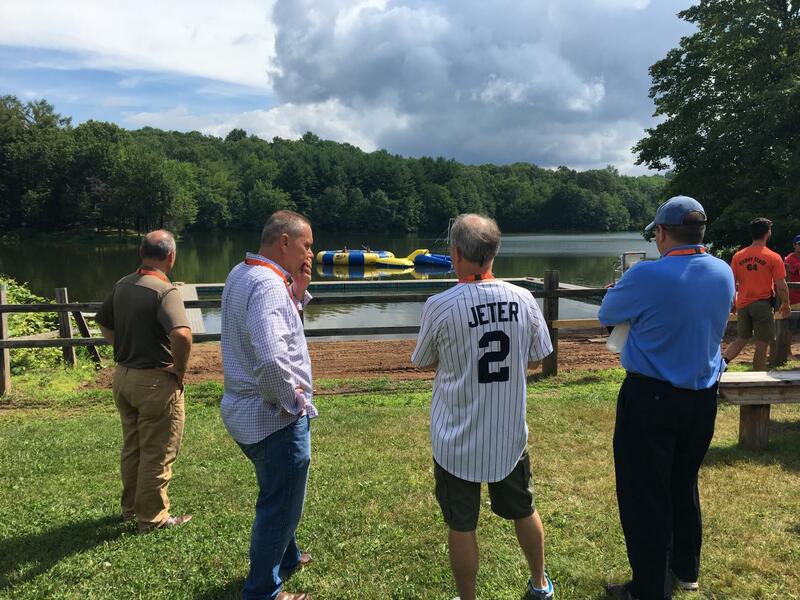 (Left to Right) Speaker of the House Joe Aresimowicz (D-Berlin/Southington) and John Myers, Executive Director, Southington – Cheshire Community YMCAs, at Camp Sloper Pond in Southington. Speaker of the House Joe Aresimowicz (D - Southington/Berlin) is pleased to announce that the State Bond Commission has approved a $3,000,000 grant to the Southington Community YMCA for dredging of the pond at Camp Sloper. These funds will provide assistance to the YMCA to develop and implement a preservation plan to dredge Sloper Pond to ensure the long-term health of the pond for future generations of the people who enjoy it as well as the wildlife who inhabit it. Due to long-term natural causes, the pond’s depth has decreased dramatically. The shallower conditions have contributed to the pond becoming more susceptible to a condition called “Swimmer’s Itch” and has also led to aquatic vegetation taking over the pond every spring, which is currently being chemically treated on an annual basis. Although the pond is still relatively healthy, if no action is taken, the pond has the potential to turn into a swamp in years to come. The dredging is expected to include the removal of 125,000 cubic yards of silt and sediment, which will improve the overall water quality. The increase in depth will reduce the “Swimmer’s Itch” condition and create an environment that is not conducive to aquatic vegetation growth, which will eliminate the need to chemically treat the pond. The funds will also be used to construct several program amenities and improvements, such as re-grading the swim areas, floating logs for turtles and other wildlife, sunken trees and rock clusters for fish habitat, a handicap accessible fishing pier, making it more attractive for swimming and more ecologically balanced. Preventative measures will also be installed to ensure that the pond can be routinely maintained in the future. “We are beyond thrilled and appreciative with the state’s approval to support our Sloper Pond Dredging Project. What a terrific validation of our efforts to protect and enhance one of Southington’s most precious resources. The Sloper Pond Dredging Project, when completed, will be an incredible gift for future generations to share and use. Thanks to our elected state officials past and present for your continued support of our Y,” said John Myers, Executive Director, Southington – Cheshire Community YMCAs. Funding was approved by the State Bond Commission on Friday, April 13th.